This topic was very interesting on our old forum and had well over 5400 views and 475 replies. So I have started it again here and copied my opening post and the first three replies we got back then. I do hope it gets the same wonderful response as it makes very good reading that sure does get you thinking. To try and get some postings on our new board, I have put up this new topic hoping to get very mixed responces. I for one cannot believe that when we pass over all is gone forever. I wish I could say I have had proof of this but alas nothing spiritualy wonderful has ever happened to me. If you have please tell us about it or if you don't believe there is such a thing,,why? I always respect peoples beliefs and would never force my own on them. I have always found this an interesting topic. I never really believed in Life after death until after my dad died a few years ago. My mum and i noticed that a few months after my dad's passing that things happened that we could not explain so we decided to go along to a Spiritualist Church one evening, something we had never done before and it was there that the medium picked my mum out of the crowd of people during the evening and gave us a message from my dad. I do have to say that there is absolutely no way that the medium knew anything prior to what she told my mum so yes i do believe in life after death. Sadly my mum passed away two weeks ago and i feel my mums passing much more because we were extremely close. My mum was ill before she passed and us both being believers in Life after death, she did say to me that she loved me and would always watch over me and guide me bless her. Unfortunately i wasn't at my mum's side when she passed which has upset me greatly and in a way i feel i let her down when she needed me the most! My mum had Cancer and i took the necessary time off work to be with her at home and when she was having her radiotherapy treatment. The day before my mum died, i was with her right up until midnight until she went to sleep and thought that if i had of stayed at her bedside and she knew i was there she would have tried to stay awake for me so i made the decision to come home and go back the following morning but unfortunately i got a call the next morning to say my mum had passed away, i was inconsolable. I was devastated and still feel guilty about that today. The strange thing is though that since my mum has passed, some strange things have happened that i cannot explain, they never happened before she died. I think it's my mum's way of letting me know she ok, i do hope so! Hi June..Thank you so much for sharing what must be painful for you to write about, it certainly brought a lump to my throat reading it. 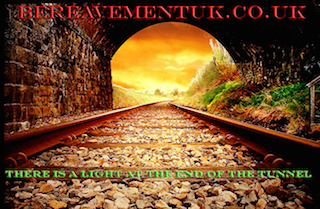 The very first thing I thought of going through your story, was that it's just amazing how many hundreds of people who have come through my site in the last 8 years have said that their loved one died when they were not their. Someone once told me that because they love us so much they find it hard to die in front of us and leave us. Somehow they seem to know we are there and wait till were gone. People who have been by a bedside all the time have said they just popped out to go to the loo, only to find them dead on their return. So please don't feel guilty June, she would not have wanted it any other way. I'm so pleased you feel something still from you Mum and Dad June and how I wish I had something like that too, but I do believe that love is such a powerful and divine thing, like in the film Ghost, we take it with us. I'm so sorry for you loss and you have my deepest sympathy. :( I wish you great courage and strength of spirit in your daily life . Before my Husband died, we spoke about this topic a lot. We were quite sure that there was an afterlife, possibly in the form of life as we know it to be. We discussed how people "click" when they meet. The expressions of " I feel like I have known him all my life", the way some people can read your thoughts and finish your sentences when they haven't known you that long. The incredible soul mate experience etc, etc. The thoughts we had were that maybe we had been married in a previous life, which is why we just knew we were meant to be together (after the first date)! So before he died, in my arms, we said we would be together again one day. I guess it helped him "let go", believing that. It helped us both. We all have energy. We know, through science, that energy can neither be created nor destroyed. So when we die, the energy has to transform... I believe that it's just pot luck what it transforms into... we have all been many things in many previous 'lives' and will be many more in future 'lives'. I believe mortal life as we know it is definitely not the end for our energies, and we will go on and on. Death may be the end for our mortal beings, but not for our energies. Re: Do you believe in afterlife? You know Saz, this is becoming very interesting what you and the ladies have posted here. I’ve never thought of it like that and it kind of makes lots of sense of many of the things we don't yet understand. I didn't want to bring religion into this topic but if you think about all the miraculous events told in the bible, they would be quite possible with some/one/thing that understood enough to manipulate the power of energy. I have often wondered that if a man or woman looses their spouse and then in time meet someone else that they fall deeply in love with and marry. When they themselves die who does their love and loyalties belong to, the first or second? Thank for posting Saz and I do so hope that anyone reading this can add something to give us all something to think about. It´s been 4 years,5 months and 3 days since my beloved man Jan died and I can´t kiss or touch another man,not even look at someone the way I did at my beloved Jan,and I don´t want to anymore as my immortal beloved one is irreplaceable for me forever.He is the best,my most beautiful and only one until I meet him again and it will be for eternity.God is immensely merciful and does take care of him and one day it will be Him who may reunite us as one in the heaven,therefore I do my best to be worthy of that as well.I believe that in the future we both will have our bodies again as Virgin Mary who was taken into the heaven with her body too;as many dead people who visit their loved ones and touch them with their bodies on this earth,although they´re already dead.It all will happen after the Last Judgement on the New Earth as Adam and Eve at the beginning.I´ve experienced many supernatural things since my beloved Jan died,starting with the big heart engraved by him 3 days after his death on the bed we were sleeping together 3 days earlier,following in many miracles he has done for me by now.This is my belief and it´s unshakeable forever,but I have respect for yours,too.I also want to tell you that my beloved Jan wasn´t ailing or ill.He died suddenly from morning till night and it was the fatal error of the doctors who killed him,I think.I also know that we can´t change some things in life and here is the reason why I think over this,because my beloved Jan died 11.11.´11 at 1 by night,and these 7 units explain it all,I´m sure.We had put up at the challet no.11 at 1 by night 2 weeks before his death and I had felt there something bad;it was death.It´s the hardest wound I´ve ever felt in my whole life.I pray,that´s all I can do.I have no family,just the best friends of mine and my belief in God.He is the only one connection with my beloved Jan now.There is so much I´d like to talk about,perhaps later.I´m a poem writer and I´ve written more than 30 poems for my beloved Jan that I´m going to post it here,and yet I already don´t find any words to describe all of my suffering I´ve experienced so far. Thanks a lot for reading these words and for this wonderful site that allows us to talk about the things like this. Faith is a wonderful thing Janka and has given many members over the years here , hope to see their loved ones again. It's good to hear your Jan has shown you signs over the years but like I said when I first started this topic, I have never been blessed with any signs or visions in my lifetime. Even so, I have no doubt their is an afterlife and as Iv'e heard somewhere before, "you'll see it when you believe it"
I know there are things that I don't understand. I believe in what I know to be true. I hear about many things that I don't understand, which I hope are true. Rests and expatiates in a life to come. " I have very little time for most organised religion but I try to keep an open mind about life and death. There are so many things about the universe we don't know. An interesting question. I'm sure we've all thought about this. Like the post earlier I think energy is never lost and whatever it is that gives us 'life' is quite possibly transformed into some other form. What that may be I think is beyond human comprehension. I certainly don't believe in a heaven and hell in any conventional sense but I firmly believe we live on in the minds of those who were close to us, in some form. Is whatever that form is capable of sending us 'signs', of sending messages via a spiritual medium? Well, quite possibly. I don't know. Can our energy re-unite with that of lost loved ones when we too die? Well, quite possibly, I don't know. I rather suspect much of what we hope is a connection comes from within our own minds rather than from externally but I think all things are possible and wouldn't dismiss anything. To anyone wanting to contact a medium, please please please contact your local spiritualist church and ask for a recommendations. They will be able to put you in contact with a genuine medium. Most hold weekly demonstrations too and everyone is welcome. It's very different to most peoples idea of church. Me and my best friend used to play cards a lot. A month after he died i found two playing cards on the floor outside my front door. There is pictures of cats on them and one of the pictures looks similair to my old cat. My house is the last one on the row so nobody walks past my door and i can't work out how the cards got there. Did fate put them there for me to find ? Does someone want me to know he is at peace now ? I put the cards up on the wall so i know i didn't dream it. I agree Pete we cannot know the answers,and i think that is what makes people reluctant to talk about things is fear of being cast out of social groups,or even the whole of society. We live in an age where things that are not scientifically proven are derided,in our society. yet Science has failed to prove that it doesnt exist either, in fact more recently quantum mechanics/physics seems to point to errors in some of the established laws of physics,and suggest much more that it is possible. We are lucky because derision is all we face,in the past and in some modern day countrys speaking of a possability other than that decreed by the powerful can have much worse consequences. I have seen "ghosts" all my life and as a child didnt think it was unusual and obviousely neither did my mum or grandma who brought me up, but i have no claims to be a medium they are just there,if something moves in my present house it will be Carrie the former resident with particular views about where things should go and where her picture should be hung, but the ghosts have not been my loved ones that have passed, although i have had signs from them which have been repeated and convincing, but it feels very different,which makes me wonder whether the "ghosts" we see are some sort of phenomenen that one day quantum mechanics will explain,maybe a parallel universe in which those people are living, moving things around throwing things maybe we appear as ghosts to them, or its some sort of anomilly in which we see a mirror of the past not an illusion because its real enough to photograph and shared by others, but something which is quite separate from signs from our loved ones. As humans we always seek answers to questions and demand explanations,accepting that we dont know the answers is a big leap which is a very liberating thing once taken because once you believe something is possible then anything becomes possible, and science and neurology becomes one of a large group of possabilitys rather than a definitive answer, so if i believe in quantum physics and an afterlife, then i can also believe in god, re-incarnation, amimal spirits,crystal healing,shamanism, ancestral gods paganism or fairys at the bottom of the garden without becoming a member of any religion or set of followers,or needing proof of one idea above the others.